This report presents the results from the baseline capacity evaluation undertaken at local and national level under the IDRC/CCAFS project “Generating evidence on gender sensitive Climate-Smart Agriculture to inform policy in Central America” implemented in Guatemala. Its objective was to map out the initial status of CSA and gender knowledge, skills, attitude and related practices in the three types of actors targeted by the project (farmers, local and national level stakeholders) in order to compare it with an end line exercise and assess the contribution of the project to the observed changes. Building on the project Theory of Change (TOC) formulated by the CIAT team to identify the expected changes and outcomes, specific questionnaires were designed for each the three target groups. In the case of farmers the questionnaire focused on assessing their level of knowledge on specific CSA practices and their potential impacts on agricultural production but also on climate vulnerability and gender dimensions (i.e access to resources, labor and decision making). With local actors additional questions aimed at assessing their understanding of a Gender sensitive approach, their level of institutional mainstreaming/implementation and monitoring, their perceived individual capacities and needs. Finally, with national level stakeholders, the questions addressed individual perceptions on the importance given to Gender in the political and agricultural sector agenda, their level of knowledge and technical expertise and their capacity to support gender mainstreaming into their institutional work. The baseline results show some level of knowledge on the CSA promoted practices (at all levels) and gender dimensions (at subnational and national levels). At farmer level, the practice most known by farmers was shade in coffee and the one less known is eco-efficient stoves. However this is the practice known by the women interviewed. Farmers consider that they have some knowledge on the effect of these practices on yield and adaptive capacity and on gender indicators. Local actors have some idea of the level of adoption of these practices and on factors that enable their adoption. They also shared having a fairly good knowledge about the intra-household gender dynamics in Olopa through surveys, local actors meetings. However they consider that they have few knowledge on the link between gender and CSA. Finally, national actors’ definition of gender is related to participation, equality, which is consistent with local actors understanding. However at national level, actors interviewed seem to integrate key aspect of the need to understand and address the specificity of women (and vulnerable groups) in terms of knowledge, needs, and abilities. For them, gender is more important at the global political agenda than at the agricultural agenda. There is few interest/ support to further incorporate gender in this sector. Howland F. 2019. 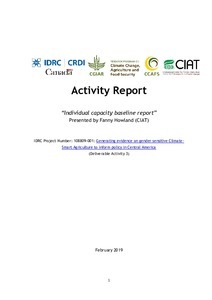 Individual capacity baseline report.